Down by five points with 43 seconds remaining in regulation of their home opener, the Grizzlies rallied to defeat the Pistons 111-108 in overtime in front of a sold out crowd at FedEx Forum in Memphis. Grizzlies Mike Conley was the game high scorer with 22 points, 19 of those coming after halftime. Zach Randolph had a double double with 16 points and 10 rebounds. Tony Allen scored 16 points. Eight of Marc Gasol’s 15 points came in the fourth quarter. Pistons Josh Smith and Rodney Stuckey each had 19 points. 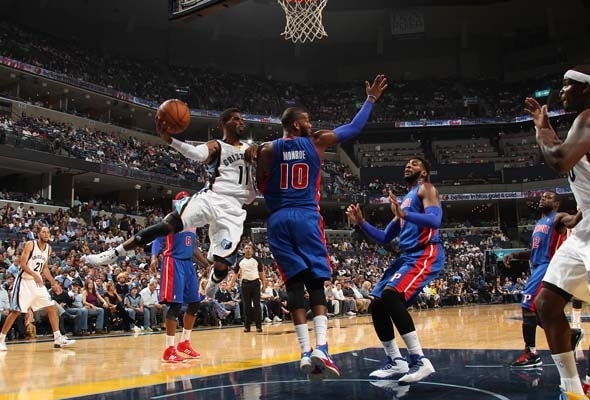 Memphis made seven turnovers in the first quarter and trailed Detroit 17-21. The second quarter was better for the Grizzlies, who had less turnovers and made their shots. Mike Miller was sinking his three-pointers, and Randolph finally came alive and was hitting his shots. Memphis led 47-41 at the half. In the third quarter, the Grizzlies were causing turnovers instead of turning over the ball like in the first quarter. Memphis put up an early ten point lead in the third quarter, but ended up trailing by two 65-67. With 20 seconds left in regulation, an offensive interference call prevented Detroit from putting the game away. Memphis tied the game up 95-95 and headed to overtime. With two steals and a key block by last season’s defensive player of the year Marc Gasol, the Grizzlies grit and grind defense pushed past the Pistons to win their home opener 111-108 in overtime. Click here for highlights of the game. Tonight, the Grizzlies go to Dallas to take on the Mavericks and return home home Monday to play the Celtics.